You’ve Found a Lost Pet – Now What? It’s happened to a lot of us. You’re driving home from work and see an obviously lost pet pacing back and forth by the side of the road. Or a stray cat keeps finding his way into your garage at night. If you’ve come across an animal that’s clearly a stray, your first thought is probably that he’s a lost pet or has been abandoned. You can’t rely on the condition of the animal to tell you which is the case. Even if the dog or cat is far too thin and covered with fleas, it could be that he’s been lost for weeks. You just don’t know the back story, so you should treat every lost dog or cat as one who has a human who is missing him terribly and wants him back. You should take the appropriate steps to make sure the animal is safe and fed until his owner can be located. We’ve outlined some steps to take when you’re dealing with a lost pet. Your initial urge may be to sweep a stray dog or cat into your arms, but this can backfire in a number of ways. If he is skittish or scared (and he probably is), you may scare him away or send him running onto the street. Go slowly, approach him with caution and don’t make any sudden moves. If the animal reacts with aggression or excessive fear, it’s best to call animal control and have them capture him. It’s what they are trained to do. If the animal seems willing to come to you after a few minutes of getting to know each other, approach him with caution and patience. Kneel down so that you’re on his level and slowly reach out a hand for the lost pet to sniff. Talk to him in a low, calming voice and use phrases that any pet might be familiar with (good boy; here kitty, kitty, etc.). Smile and offer him a treat if possible. If he won’t come any closer, slowly approach him at his level. After you’ve gained the animal’s trust and are able to touch him, secure him so that he doesn’t run off. You could wrap him in a towel, put a leash on him or (if it’s a small dog or cat) take him into your car, garage or wherever works. Offer your new friend a bowl of fresh, clean water. Most strays and lost cats or dogs get dehydrated and they will need fluids. This is definitely the case if you’ve rescued a pet who was in a hot car or some other place where the temperature was high. Any stray animal is likely to be a bit battered or bruised. Carefully check the animal over, looking for open wounds, possible broken bones and other injuries. Also watch for areas of pain. If he flinches when touched or is limping, there is something wrong. Make sure you get the lost dog or cat to a veterinarian for treatment as soon as possible, where they can give him any needed treatment. If you have a pet first aid kit in your car or home (they are easy to put together), use it to treat minor injuries such as scrapes and minor cuts. Most lost pets will have a collar with ID tags and contact information. If this is what you find, you’re in luck. A quick phone call may be all that’s needed to reunite him with his owner. If there aren’t any tags, call the nearest veterinarian’s office or animal shelter and arrange to have the animal scanned for a microchip. If there’s a microchip, use the information on that to contact the owners. If there are no tags or microchips, take the time to check out online “Lost Pet” postings in your area, look for “Lost Pet” signs in the area and put up some “Pet Found” flyers with your phone number of the phone number of the veterinarian’s office where the dog or cat is being treated. 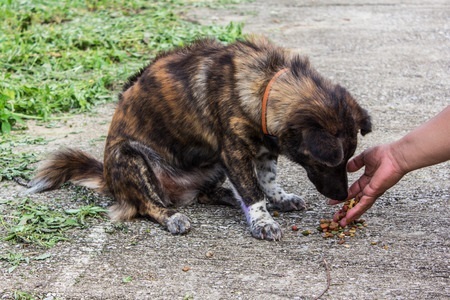 If the animal is truly a stray – that is, he doesn’t have any owners – you can decide what to do after the dog or cat is seen by a veterinarian and is on his way to being healthy. If you choose to keep him as a new addition to your family, be sure he is properly vaccinated and treated for any possible illnesses. Finally, keep in mind that if you opt to keep a dog or cat that you’ve found, his real owner could show up at some point – and you’ll need to return their lost pet to them. Helping a stray cat or a lost dog is always a rewarding experience, but one that can also be painful. Be sure you are up to the task before swooping in to rescue an animal. If you aren’t certain whether you can follow through, simply contact animal control or the nearest, no-kill shelter and let them handle the situation in the best way possible for the animal.